Some lumps don’t aspirate well and so a diagnosis can’t be made without collecting a biopsy sample. I routinely do fine needle aspirates on lumps and if I can’t identify the cells under the microscope, then I recommend sending off the sample to the pathologist or collecting a biopsy sample. Otherwise, you have the choice of measuring the lump and keeping a very close eye on it and it if starts to grow quickly then book in your pet for surgical removal of the lump. In geriatric patients, fatty lumps or ‘lipomas’ are quite common. It is an abnormal deposit of fat under the skin and we aren’t exactly sure of what instigates their development. Overweight patients and certain breeds like Labradors, Golden retrievers and Corgis seem to be quite prone to developing this type of lump. They are usually soft and unattached to the underlying tissue and benign. Lipomas are easily diagnosed with a fine needle aspirate. This is a lipoma examined under the microscope. It appears like water droplets on a slide. These lumps must be closely monitored as they can occasionally become cancerous. We don’t often resect these lumps as they generally recur. However, if they are causing discomfort for our patients or impeding their mobility due to their location or size e.g. in the axillary region (constant friction), then we recommend removing them. We also surgically remove them if they grow too big as they can burst. Occasionally, they can grow between muscles and feel quite hard and be mistaken for nasty lumps. The take home massage is just because ‘lipomas’ are common in geriatrics, it does not mean we must assume it is one without getting it checked and that includes a fine needle aspirate being performed. One of my most adorable geriatric patients came in as his owner noticed a sudden growth over his shoulder. It was not painful but had grown very rapidly and was quite large; about the size of a soccer ball. Palpation revealed it was a very hard lump and the fine needle aspirate was inconclusive. We proceeded with immediate surgery to investigate the lump. Oscar under general anesthetic investigating his very large hard lump. This is an inside view of Oscar’s lump. At that stage, I was still very concerned and collected a biopsy sample and sent it off to the pathologist. Thankfully it turned out to be a lipoma. It is important to confirm they are histiocytes and that would involve sending either a fine needle aspirate or biopsy sample to a pathologist to examine. Generally they spontaneously resolve after a few weeks. I tend to prescribe antihistamine for patients with this type of lump as it will help reduce the irritation and itching associated with it. 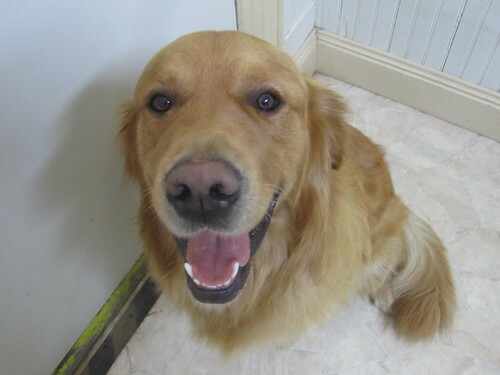 ‘Simba’ is a 2 year old golden retriever that developed a 5 cent piece reddened fur-less lump under his jaw. It was itchy and that’s how the owner noticed it. We collected fine needle aspirates and sent them away to the pathologist and results came back confirming it is very likely a histiocyte. The lump disappeared on its own. This young jack russell terrier presented to me with this lump under its right eye and it was at a very tricky spot if surgical resection was required. I proceeded with a full general anesthetic and collected a biopsy sample of the lump. I needed a definitive diagnosis of the lump and the fine needle aspirates would not have been sufficient. Thankfully results confirmed it was a histiocyte and it also disappeared on its own. ‘Penny’ was only 6 months old and she suddenly developed a reddened fur-less lump over her right shoulder that kept growing rapidly until it reached the size of a lemon. We proceeded with surgical resection of the lump and sent off a biopsy sample from it which confirmed it was a histiocyte. This is a picture of her after she had recovered from her surgery. The scar is the war wound she was left with after her surgery. Now I would like to talk about the dreaded ‘mast cell’ as this is one of the most common cancerous skin lumps in dogs. In my experience, these tumors can come in all shapes, sizes and forms. They can be irritating and sometimes they can appear quite inactive. I don’t think this tumor fulfills its typical textbook description. I always offer to do fine needle aspirates on any lumps discovered on your dog or cat to rule in/out a mast cell. 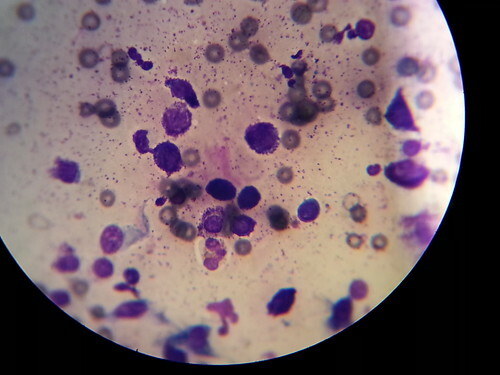 I often diagnose mast cells on fine needle aspirates. In any case, the next step after that would be resection of the lump with a decent margin (minimum of 1.5-2 cm) and sending it off to the pathologist. For those mast cells in very difficult locations like distal limbs or high grade ones, I give the owners the option of taking their pet to a specialist for complete resection. The specialists have the advantage of advanced imaging like CT which will delineate the margins of the mast cell and if it has already spread. 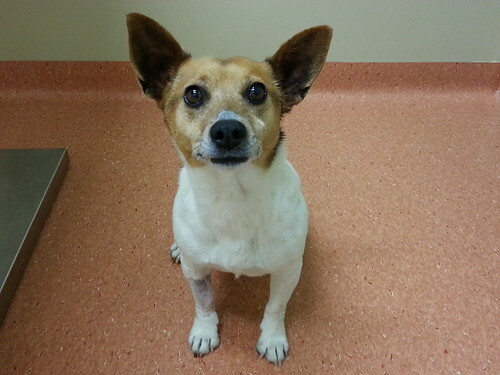 ‘Ella’ is a 6 year old female desexed fox terrier cross in premium health. She presented to me for a swelling over her right elbow that would spontaneously shrink then bulge. My examination of the affected area made me suspect she had a joint issue. Xrays were absolutely normal so I proceeded to collect a fine needle aspirate of her lump and this is a picture of the sample under the microscope. I was actually shocked to discover it was a mast cell as it didn’t fit the typical presentation. 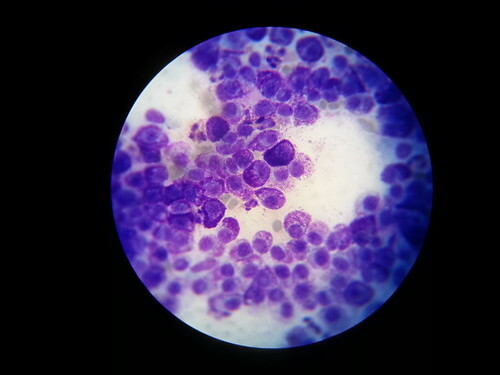 In the pictures below, the densely purple cells with purple granules are the mast cells. As for ‘Charlie’, he sure has been unlucky in that he has had 3 mast cells resected from him over the past 2-3 years. His first two mast cells were discovered when he was 5 years old. Thankfully his owners attended to them fairly quickly and they were all completely removed. 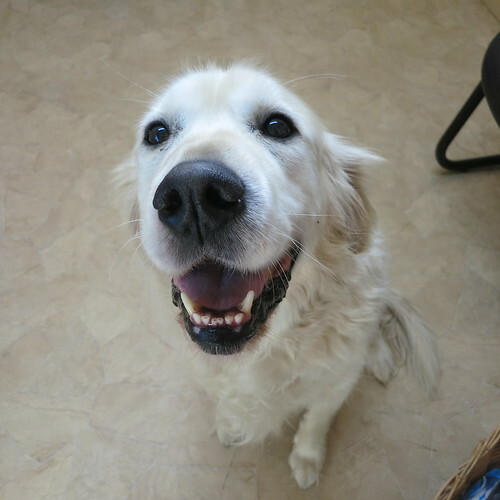 This is ‘Cindy’ and she is a 13 years old golden retriever that developed this very large lump fairly quickly behind her ear. My colleague proceeded with removing the lump and unfortunately an ear ablation was required for complete excision of the lump. In cats, mast cells present in a much more diffuse manner and can be wide-spread throughout the skin of the patient. 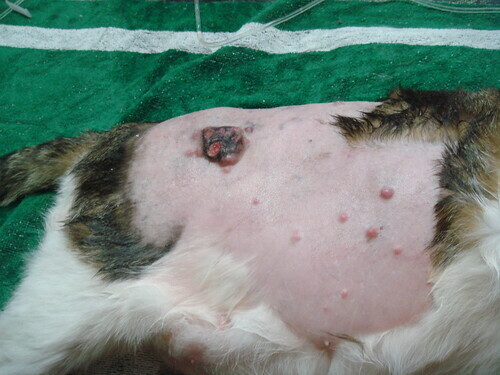 This is a picture of a geriatric cat with a very aggressive form of the mast cell tumor. Bottom line is you should never judge a lump by the way it looks. Palpation alone is not sufficient to make a diagnosis. Your veterinarian should offer to do a fine needle aspirate for any routine lump check. If the fine needle aspirate isn’t conclusive, then you must either closely monitor the lump or organize for it to be biopsied by your veterinarian. What a great resource, Rayya! I will definitely be sharing this with my clients who are interested in learning more about the various lumps and bumps that our pets can get. The vast majority of my FNAs turn out to be lipomas, but I know it’s still necessary to do them just in case. Thanks for your input Elliott. Great to hear your are going to share my post with your clients. I have been shocked once too many times when collecting FNAs of lumps that I expect to be lipomas and turn out to be mast cells or some other nasty. This happens so much with our pets, have seen it too many times. My sister’s dog had a big lump cut out years ago. Poor dogs. Great blog, so much info and great photos! Thanks heaps for your great feedback John. They recover pretty well from lump removals so that’s always terrific to see. As always, Dr. Rayya, your information is very helpful for all of us Pups in cyberspace. Thanks for making me feel better about my lumps. The old woman Slow worries herself crazy about ’em, but Hottie Doc says no worries so we roll with her. You’re the BEST!! Reblogged this on Town & Country Lifelong Learners – Southeast Valley Kennel Club. Thank you very much RAYYA that was really interesting . Please keep the information coming . Thank you very much , I always get some thing out of your posts that helps my ageing fur gang . I concur – very interesting, but I honestly get nervous reading this stuff cause I want everyone to be okay! You are so sweet. I am hoping my post will help prevent any major issues from occurring. If we catch the lumps early, the prognosis is improved a lot. Another fine article Rayya and a great resource. Look forward to the next one. Thank you for explaining the differences in the lumps and bumps our pets get – so much helpful information, Rayya. I’m going to re-blog this and put it on my FB page for pet owners. Looking forward to the sequel to this post. Thank you so much for enjoying my post and sharing it on your page. I really appreciate it. Watch out for the sequel to this post. Absolutely great information to any pet owner. Thanks a lot Paul. Glad to hear. Thank you so much Dr. Rayya for this valuable information. You are wonderful to share your knowledge with your followers. Bless you! Hugs and nose kisses from me and my sweeties! I found a lump on my dog (3 year old lab mix) last week. It was about 1 cm in diameter and very red/inflamed. The vet said it was a mast cell tumor and aspirated it to confirm this before scheduling surgery. However, the cytology report stated there were no mast cells, but a lot of inflammation and scattered sebaceous epithelial cells. 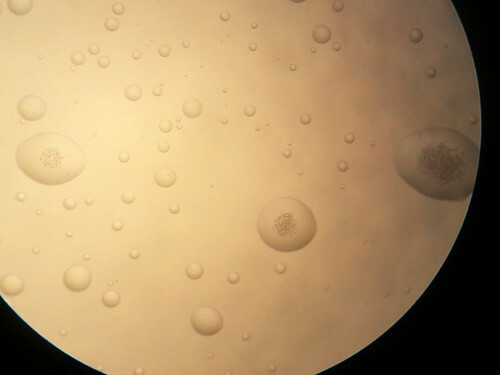 It also said that the cellularity of the sample was low. Now, instead of doing surgery my vet put her on Clavamox for a week because now he is saying it might be an infection. After 2 days of antibiotics, the lump has shrunk and is no longer ulcerated, however it is still pink (it sort of looks like a bug bite now). I am wondering if we are being too conservative. I don’t want to put my dog under needlessly, but I also don’t want to “wait and see” when we could be dealing with a very aggressive cancer. My vet said that the absence of cancer cells on the aspirate was a very good sign, but from everything I have read, it doesn’t mean much. I know this is not a Q&A blog, I guess I’m just looking for more thoughts. This was a really useful post and I appreciate it. Thanks for sharing your experience. There is no black and white answer here. Your vet has done all the right things. He collected a fine needle aspirate and then started medications. The fact of the matter is the lump has shrunken. I think you should closely monitor the lump, measure it. If it is bothering your dog or flaring up again, then it should be biopsied/resected. I hope this information helps. My oldest doggie Jewel (9) just had five growths removed all were fatty except one a tiny one on her ear. We are watching this one to make sure it does NOT turn into cancer. Thank you for writing about this! Last summer we had two benign fatty tumors removed from our dog. The one on the right side behind the right front leg was slightly smaller than a grapefruit and required a shunt for a week afterwards for draining. The one on the left side was much smaller but more painful as it was between two muscles. The surgery was expensive but successful. It took Maggie weeks to adjust (we didn’t put her in a cone but in one of my husband’s cotton tee-shirt with a Thunder Shirt over it to keep it in place–she looked like a girl in a parochial school uniform). It took months for her wonderful rich coat to grow in where she’d been shaved. We knew from the beginning the tumors were benign, but left to grow they would have made Maggie lame. She is a rescued dog, a mixture of many strong and beautiful breeds, and we’ve had her for 11 years. We would not sentence her to an inactive life. Now she runs in the mountains with us, along trails and in streams. It was worth the price, the surgery and healing time to give her this renewed chance. Hey Marylin. I really appreciate you sharing Maggie’s experience with us. Like you pointed out, some lumps simply have to be removed as they can impair your dog especially if they are around joints. Glad to hear she fully recovered and you thought it was all worth it. My first guide dog Luther was a big yellow lab and when he turned seven, he developed a lipoma just behind his left shoulder blade. Thing was freaken huge and I freaked out at first, obviously cause I did not know what the heck it was. You could clearly identify it just by looking at him, as it looked like a tennis ball, lol. Took him to his vet where he was biopsied and all came back clear. So sorry about the delayed response and thank you so much for sharing your own personal experience with a lump. Very insightful. Glad your Labrador only had a lipoma and hope it doesn’t grown any further. Thank you for your article. My 13 year old GSD has a lump that came up quickly by his tail. Our vet just did a smear in lieu of a FNA and told me it is just as good. He told me he saw angry cells and we set up a surgery. Needless to say, at the time I didn’t ask questions and accepted what he said but now I have doubts. Is a smear just as good as a FNA? Isn’t it better to know what your dealing with before surgery if possible? I think we should have a FNA done to know, and any other tests that may be helpful to get an idea of size ect. I don’t want to put my 13 year old GSD through a surgery if it isn’t necessary, or if it is to big of a surgery for him to recoup from if it is more then just a lump. Should I go see a Vet Oncologist? Thank you. Thanks for contacting me. Effectively the content of a fine needle aspirate are turned into a smear to examine under the microscope. Your vet did the right thing. Fine needle aspirates aren’t always diagnostic and usually give you a rough guide on the next best step. A biopsy is more effective and should be sent in formalin to a pathologist. 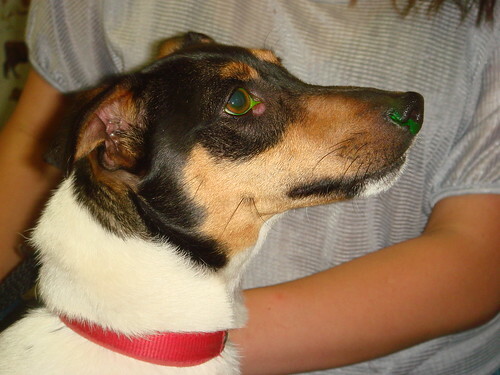 It can only be detected if your dog is sedated & the sample is collected under local anaesthetic. 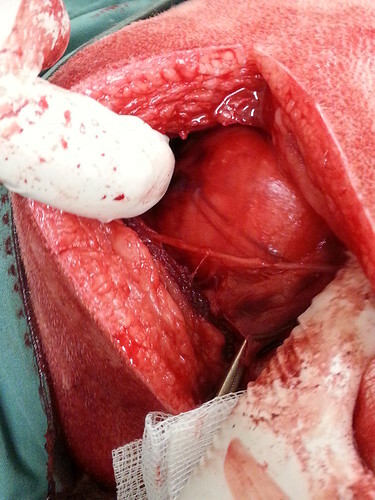 The other option is to just go forward and remove the lump with good margins and send it off to the pathologist. The debate is whether or not you want your dog to go through a sedation and then a full general anaesthetic OR just undergo one procedure. I highly recommend you go back to your current vet and discuss all your concerns and together you can decide what is best for your dog. Hi, my flat coated retriever Jasper is 6 yrs. About 8 months ago we noticed a small squishy lump in his neck, about as big as a pea, just under the skin. Showed it to the vet, who said v likely fatty lump, keep eye on it but not to worry. It has grown a little and he also has 2 more similar lumps now, one on his side and one a little lower down his neck. 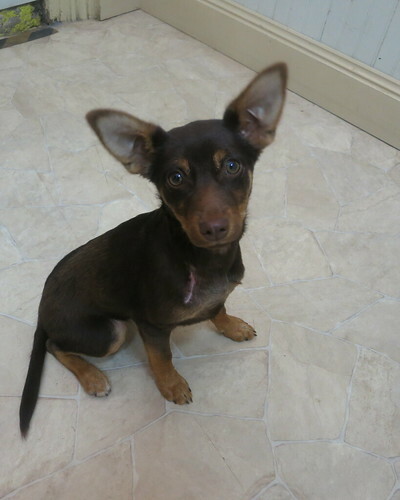 Again showed them to our vet who immediately suggested removal, but didnt offer an FNA. I decided to seek out a second opinion as i don’t want to put him under if possible. Second vet has done an FNA from all 3 lumps today. I saw him doing them and putting them on the slide, he commented that the samples looked a bit cloudy for fatty lumps. He has sent them away for analysis and now we must wait. He said fatty lumps FNAs are usually clear not cloudy, would you agree with that ? In general they are clear but I have seen cloudy samples too. Your vet has done the right thing. If he/she wasn’t sure the lumps were fatty lumps, it is always best to send them to a vet pathologist for confirmation. I found a little lump on my 6 month pug this weekend. It’s located where his chest meets his armpit. I think it is a bug bite, we went to his obedience lessons last Wednesday and I came home with a million bug bites all over my legs, so did my husband. Now I’m a little paranoid, the little lump it’s still there, it’s kinda hard, it gets bigger when we touch it. It doesn’t bother my dog and it’s not red either. I’m taking him to the vet in 2 hours. I was just wondering if a bug bite can create a little lump in a dog? It gets bigger when I touch it because it’s like a hive, when you scratch it get inflamed? My dog developed a small round lump under his left arm pit about 2 months ago. It developed suddenly, and has not changed in size or texture since. It is soft and moveable to the touch. Just today, I noticed a very hard little lump behind his right shoulder blade. Now I am worried. I have an appt at the vet on Monday but will be worried sick until then. Any words of advice? Well done on booking your dog in for a vet check. Unfortunately, I can’t really give you much advise based on the history provided. It is definitely important to get both lumps checked out tomorrow. Our Chihuahua is 14 years old. A year ago he developed a lump over the right side of his head. We took him to the Vet. He told us a few things, one it would cost us between $1500.00 – $2000.00 to have it removed. Two, because of his age he may not make it through the procedure, also because he has breathing problems. Three, it will come back anyway. He has Arthritis and has a hard time breathing. We love him so much. Now the lump is starting to grow down and is getting close to covering his left eye. We feel like we are being selfish by keeping him going. The Vet told us he isn’t in any pain concerning the lump. I think we just need someone to help us decide, I know we are being selfish. We love him, and want to do what is best for him. He still loves to play, run around, chase his ball, play just as if he was a puppy, that is why it is so hard to decide. Dear Sam. Sorry to hear about your dog’s condition. You are obviously being guided by your vet. I personally always tell my clients, you will know when it’s time. If his quality of life is deteriorating (off food, not interested in playing, lump bursts or so forth), you will know it’s time. Enjoy the precious time you have left together. Hi Rayya, thank you so much for all this information. I am concerned about my 3 year old tonkinese girl Isis. When she was one and a half, she had a rabies shot (2nd time, she had already had one as a kitten) and had a severe anaphylactic shock. I haven’t had her re-vaccinated since and don’t intend to. But ever since that injection, she’s had a small lump next to her spine (the vet injected her in her lower back), which feels like a small fluid-filled sack of some sort. I initially thought it was an injection knot but it has never disappeared and I think it has grown ever so slightly now. My new vet says it is probably benign because it isn’t hard, but shouldn’t she have it tested? Do you think an injection knot could go straight from inflammation to cancerous tumour? PS: What are your thoughts on over-vaccination? Ever since Isis’s terrible ordeal I have been reading up on duration of immunity and over-vaccination in animals and have come to the conclusion that we may be chronically over-vaccinating (and thus potentially poisoning) our pets! I have resolved to have Isis titer-tested from now on, and only vaccinated if she lacks the proper amount of antibodies. Shouldn’t we all be doing this rather than vaccinating our pets yearly? Here in France vets still vaccinate their pets on a yearly basis. I’d be very grateful for your insights on this! Thank you so much in advance and well done for sharing your passion with the world! Thanks for your good feedback on my post. Sorry to hear about your cat’s severe anaphylactic reaction to her rabies vaccination. With regards to the lump she developed after that, it could definitely be cancerous. I am not sure if rabies vaccinations have been proven to do that. However, in Australia, FIV (feline immunodeficiency virus) or FeLV (Feline leukaemia virus) have been proven to cause sarcomas (a type of soft tissue cancer) and so we recommend they are injected into the extremities (leg) as this will allow us to resect the tumour via an amputation if required. I don’t want to frighten you with the above information and this may be different with rabies vaccinations. Generally I always recommend a fine needle aspirate is performed on any lump. This means collecting a sample via a needle and examining the sample under the microscope or sending it off to a pathologist. Some lumps don’t aspirate well (sacromas are one of them) and so this could lead to a misdiagnosis. If the lump has been the same size and not bothering your cat for a long time, generally it means it isn’t aggressive but that is not always the case. I think it is important to have a chat to your vet and request the lump is investigated appropriately either with a fine needle aspirate or a punch biopsy or even getting it resected and then sending off the sample to a pathologist. As for your other question about vaccinations, there is a growing concern about over vaccinating in Australia. We have definitely cut back and now recommend kittens get their first two vaccination boosters one month apart, then a repeat in a year then triannaul (every three years). In Australia, we are fortunately rabies free so I can’t really tell you if that applies to rabies. We offer FIV & FeLV vaccinations but uncommonly. If your cat is predominantly indoors and doesn’t live in a household crowded with cats, we don’t see the virtue of vaccinating against FIV & FeLV. The biggest concern for most vets in this debate about where or not we are over vaccinating is the concern that clients will forgo bringing their pets for their annual health checks which are highly recommended to ensure your pet is in peak health. At our clinic, we do run titres to check our patient’s immunity and that guides us as to whether or not they require a booster. Please let me know you go. Thank you so much for your time and generous reply, I am going to have Isis’s lump investigated the way you suggest. The thing that upsets me is that it is so close to her spine :(. I will keep you informed. I also adhere to (and will spread) your take on vaccination protocols and am glad to see that Australian vets are re-thinking their practices, you should talk to your French colleagues! Many thanks once again, your help is truly appreciated. You are most welcome. Isis is very lucky to have a very loving and dedicated owner like yourself. Goodluck. You obviously have the best intentions for your dear little Isis. I definitely don’t recommend rushing into surgery unless you are home afterwards for the recovery. If the lump under her chin is growing rapidly or bothering her, then it is definitely worth resecting. Otherwise, you can monitor the lump super closely instead. Each vet clinic has its own set of anaesthetic combinations and protocols that they like to use. Ketamine is often used in cats as it keeps the blood pressure from dropping too low. We definitely intubate all our cats undergoing a full general anaesthetic and surgery. The only exception would be our cat castrations as they are super short procedures. With regards to wound management post operatively, we definitely recommend 10-14 days of keeping your cat quiet and possibly indoors to prevent the wound getting dirty and to allow it to heal. You have done the right thing getting all the information from your vet clinic. It’s important to discuss all your reservations directly with the vet managing Isis so you can both decide together on what is the best next step in managing Isis’s lump. I hope my information has been useful. Best of luck with the Dubai move. Bet Isis is going to miss you so much. I have an 10.5 year old lab that has literally a basketball sized, rock hard lump on his left shoulder. We noticed it when it was about a tennis ball size or smaller lump. Our vet tried to aspartate it, but couldn’t get anything out of it. Due to his age, the vet recommended not putting him under Anastesia. We took his advice and returned a few months later as it continued to grow rapidly. He stated Shadow would probably live a total of 6-8 months from the initial visit. It’s been 10 months. Shadow lost about 35 lbs and now is about 90lbs. He is 30″ tall. He has slowed drastically but rimadyl has helped. We feel it is too late to try and remove it, but have been second guessing ourselves the whole time, not wanting to lose him any sooner than need be (not surviving surgery) but wandering if its removal would give us a couple more years with him. What would your recommendation be? Sorry to hear about Shadow’s large lump. I think you have done all the right things by taking him to the vet quite regularly to address the lump. Personally, I would have addressed the matter quite differently to your vet if Shadow presented to me. If the lump didn’t aspirate well, I would have suggested collecting a punch biopsy under mild sedation & local anaesthetic to determine the type of lump. As the lump continued to grow, that would have indicated it is important to biopsy it sooner rather than later. Given your dog’s current situation, I would still recommend biopsying the lump under light sedation & local anaesthetic so that you know exactly what you are dealing with. Histopathology will tell you if it is a very aggressive tumour or if it is benign. If it turns out to be one of the less aggressive type of tumours, I would then recommend full blood work to check that your dog’s kidney and liver function are okay to withstand a general anaesthetic. We have sometimes proceeded with palliative surgery to reduce the size of the lump especially if it compromising the patient’s mobility. On other occasions, some lumps are benign and can be fully surgically removed. It boils down to the biopsy results coupled with the blood work. Chest xrays may also be indicated if it is an aggressive tumour to determine if it has spread to the lungs. In that case, unfortunately you can only manage him with palliative medications and he will require more than just rimadyl. He will need stronger pain killers like tramadol or an opiate (morhpine) or etc. I hope this information helps. Please let me know how Shadow goes. Best of luck. Thank you so much Rayya! I wish I found your website 10 months ago! We have already decided that we will no longer use this vet as other than yearly check ups, he hasn’t impressed us. We do have a very good animal hospital in Fairfield, NJ that we will bring Shadow to, although pricey. (Spent $6000 on a hip replacement for our mastiff-actual surgery done in tinton falls). Our vet never mentioned a local anesthetic for the biopsy and stupid me should have thought about that rather than the complete “knockout”. We had a friend whose 8 year old GDane had a heart attack the day after stomach surgery to remove a lodged carrot, so that was our main concern with Shadow. Thank you again Rayya for your advice and being there for us pet owners!! Ps- his breathing doesn’t seem labored at all, hopefully a good sign. I am glad I could be of help. You are most welcome. Good to hear Shadow isn’t suffering from any labored breathing. Please do up date me on how he gets on. Best of luck. I just discovered a small lump on my cats neck right under his jawline. I’m thinking it’s either a lymph node or his salivary gland. It is moveable and doesn’t seem to bother him when I was touching it. I am praying that it is from an infection as he has been a little bit sneezy, and my other thought was maybe my other cat scratched him when they were playing (they play bite each other’s necks which I always yell at them for). He is 3 years old and was born with FIV. I am freaking out because I have to wait until Monday to try to get an appointment seeing as they are closed tomorrow. I’m so nervous. He just had a checkup in early January and was fine then. Sorry to hear about your cat’s lump. If he is becoming unwell and off his food, I would contact the vets sooner. You can reach a vet afterhours for urgent cases. FIV compromises his immune system and the sooner you address his illness, the better. However, if he is eating and drinking well, has no signs of drooling, and doesn’t have a fever and the lump isn’t growing excessively, you can hold off until Tuesday. My recommendation is you call the afterhours vet and discuss your concerns and you can jointly decide if he needs to be sooner then Tuesday. Goodluck. Hey Domna. Sorry to hear about your dog’s lump. 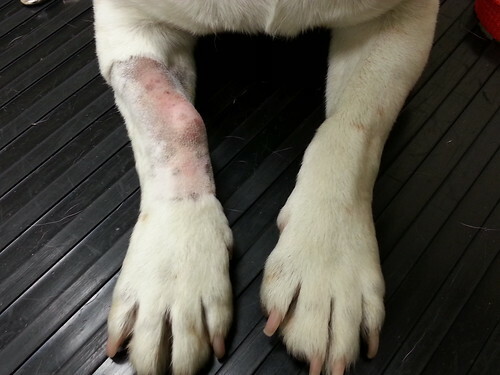 If you are super concerned then get your vet to biopsy the lump immediately. You don’t have to wait for four weeks. The sooner you get a definitive diagnosis, the better. If it’s benign, it’ll give you relief and avoid you worrying for four weeks. If it isn’t benign, you are able to discuss all available treatment options and get started asap. Good luck. Hi, my dog a small dog who has developed a lump on his head. It was small at first now it is the size of orange. The Vet told us that he could remove it, however, because of his age (14) and his breathing and his age he probably wouldn’t make it through the surgery. The lump also would return within three months. The cost of the surgery at that time was $2000.00. It has gotten so big that it covers one eye. It doesn’t seem to cause him any pain. Please could you give me some advise, He also suffers from Arthritis. We aren’t sure if we should put him down, which would break our hearts. Hello Lorraine. Sorry to hear about your dog’s massive lump. I honestly can’t give you any real advise without examining him myself. Based on your description, something definitely needs to be done. If the lump is very large, it will reach a point where it may rupture and get infected and be painful. It may or may not still be possible to resect it and this can only be discussed with directly with your vet. I highly recommend you take him back to your regular vets to discuss all options and decide on what is best for him. It is important to think of his quality of life and whether that lump is impinging on that. I hope this information helps. Take care. Thank you so much. That’s all very helpful and I will definitely update. Dear Lorraine. Have you taken your dog to the vet? I honestly can’t give you my professional opinion without examining your dog myself. I definitely think your dog should be getting pain relief prescribed by your vet based on the information you have informed me. It’s always very hard to make the big decision and so it’s important to get your vet involved. Dogs are such loyal and loving creatures and are really good at hiding their pain. The subtle signs include decreased appetite, weight loss, decreased activity, listlessness etc. Hope this information helps. Hello, yes we have taken our dog to the Vet. The vet told us because of his age he may not make it through the surgery. He is almost 15 years old now. 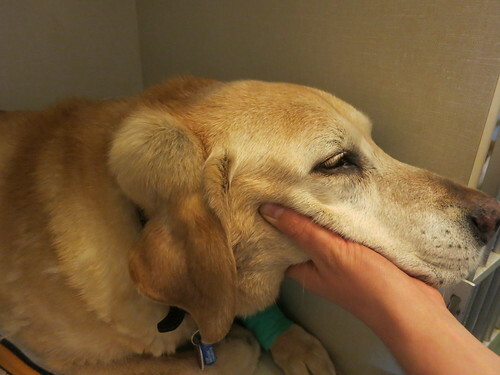 His breathing is bad plus he has arthritis, The lump is now covering his left eye, and the lump is getting bigger. The Vet also said that even if he made it through the surgery, the lump would come back. We know what we have to do, I guess we just need to hear from a professional. We will have to get used to the idea and make the decision. Thank you for your input Doctor. ps. I will let you know what and when we have decided what to do. Hi again Rayya. I just wanted to update you and for anyone reading this. Sadly it isn’t good news. The lump was indeed a sarcoma – a poorly differentiated hemangiosarcoma to be precise with a very poor prognosis has been given. The location and size of the lump is such that the vets aren’t confident that an operation to remove the lump will be a success and it isn’t clear (without further tests) if this is a secondary tumor in any case. Unfortunately we have had to come to the decision that our beautiful boy will be put to sleep, just can’t do it right yet as he still seems really happy right now, acting completely fine, loving his food and exercise (and cuddles)! Dear Katie. I’m sorry to hear about the diagnosis and poor prognosis. Thanks for sharing this with us as it must be super difficult. Enjoy every precious moment you have left with your lovely and loyal pooch. 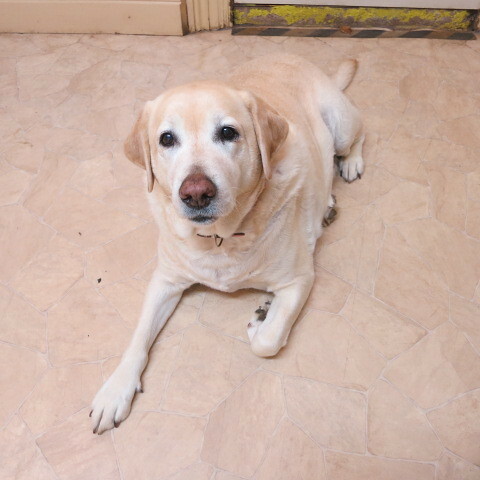 Hi Rayya I am taking my dog to our vet this afternoon she is a 11yr old irish wolfhoud x noone seems to know what she is x with, she had developed a lump in her back right knee it is very solid and the size of about a grapefruit it is growing very fast. My vet already informed me that she may need to be euthanised 1 she cannot walk on her leg but is still trying to use it 2 she has no balance, 3 because of her age surgery may kill her anyway. Over the past 2 months she has changed all she doe’s is sleep she eats less than half of what she did 2 months ago, and she will do this little whine when she does’nt think we can hear her. Also she has started coming to each one of the family placing her head in our laps and looking up at us, this is something she has never done, she would normally place her paw in our lap and wag her tail so fast you would think she would fall over. my family are so upset, we know and understand that aging is a process we all go through but it is still hard. in september we had to get our beagle euthanised as she attacked another dog the dog required surgery, no the other dog did nothing wrong. our dog just didnt like her, but our local council is very tough on dog attacks. Hi, Thank you for sharing so much on the lumps and bumps! My 11 yr. old Dane Karlee has a huge hard lump that will not move, on the left side of her chest adjoining her leg. It has become so large she sticks her legs straight out when she’s laying on her side. My husband has been laid off so we don’t have the money for extensive bills, but I want to find out what’s wrong. I hope the needle will be enough due to the lump being so hard. Well I’m sad to say that our little guy “Shadow” our Chihuahua, had to be finally put down. The lump on his head started to bleed and bother him. We tried everything. the Vet said once again that because of his age, breathing problems, arthritis and other things it was just not in his best interest. I know that sounds terrible.It took us a week or two to come to terms that we had to let our precious little guy go. When you love your pet like we loved our Shadow, we knew what we had to do for him, not what was good for us. It was a very hard day but we did it. We said our good byes. On May the 12th our little guy left us. I know I’m carrying on, I just want you to know, it wasn’t easy for us to say goodbye. Great blog on lumps. Have you any images of mast cells removed or what they look like during surgery? One of my dogs has now had 5 mast cells removed ranging from grade 2-3 (waiting on histology for the latest 2). We’ve done the chemo route and am not prepared to do it again as it took too much out of her. She’s a very nervous rescue girl. Curious to see what these rumours who invaded our lives look like. Sorry that should say curious to see what the tumours look like not rumours !!!! Dear Shauna. Well done on looking after your dog so well. Sorry to hear she’s had so much mast cells removed. Unfortunately no I don’t have any pictures taken of mast cells during surgery. They aren’t identifiable except at the microscopic level. Hope your dog doesn’t get any more mast cells. I have a 14 years old female JRT she has a lump on her chest. According to her vet it is not a bad tumour but excision is not possible because of her age. Is there any other ways to stop it from growing ? Can I send her photo so you can give me a second opinion. I saved two kittens I found on the side of the road in a box they are about 9 weeks old I think the little female calico has a large hard ball lump under her left side of her neck she doesn’t seem to be in pain but I’m very worried and am wondering what this could be she eats a lot and plays a lot ! Her brother has a small ball lump its hard also under his left leg near his side/belly I’m worried they are very sweet and I fell in love with them as have my two kids should I get them to a vet asap? Hello Jenelle. Well done on rescuing those kittens. Sorry about belated response. Have you taken them to vet? Hope all’s been sorted. Our 6 1/2 year old beagle had a fatty tumor removed 2 1/2 months ago. Everything was fine until a day ago. Now, she has a slight limp, walks gingerly and is sluggish. The removable site is not inflamed or warm to the touch. She is eating and drinking plenty of water. I will be calling the vet tomorrow but just wanted your opinion. Thank you. I forgot to mention that she also walks slow and hunched over. Thanks again. Dear Karen. Hope everything is ok with your beagle. Sorry about the belated reply. How did she go? My 5 yr old boxer had a large lipoma removed off his right side near his flank in Nov. 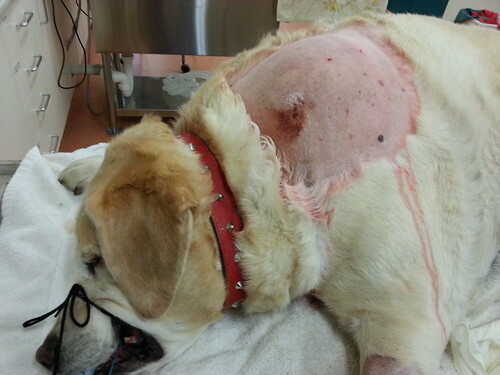 In June we noticed him licking his side below his surgical scar & the area was puffy like it was filled with fluid. So we took him to the Vet immediately…she did not like the look of his side & abdomen area. She did 3 biopsies & they all came back as fat tissue much to our relief. Too make a long story short he had another surgery to remove the large flattened lipoma in his abdomen. His Dr said it was a tough surgery because the fatty tissue was intertwined with the muscle but she was confident he would make a full recover. Now 8 weeks later Rocky is exhibiting all the same symptoms over again! He is licking his abdomen & flank area until it is raw & it is swollen! I am beside myself!!! Could the lipoma have grown back again already? So what do you think is going on? Will the tumor keep growing back? Is there any way to keep Rocky comfortable without another surgery…especially so soon? Should I get a 2nd opinion? The thought of Rocky going thru another surgery so soon makes me want to cry. Dear Rita. I’m so sorry to hear about the ordeal Rocky has been through. Did the lumps resected get sent for histopathology? Unfortunately, sometime lipomas can turn into liposarcomas (aggressive fatty lumps). I would be seeking referral to a specialist for a second opinion if that’s available to determine the next best step in Rocky’s management. Hope this information helps. My cat has a lump under his armpit. Im thinking its a swollen lymph node because if I feel around for a minute, I can find a much smaller lump on the other side. Thanks Dr. Rayya for the great information about tumors. My 17 yeard old Toy Terrier happens to have a similar tumor of Ella’s the 6 year old Fox Terrier. The tumor is exactly in the same spot, the right front leg, with the difference that it has grown in my dog and it is hard now. Do you think it could be a mast cell. hello my 7 year old boxer has a small ball type lump in his belly, cant see it but I feel it. He acts fine, plays, eats – actually a little more than usual. I have a vet appointment but was wondering what you thought. Dr my 9 yr old wire fox terrier was diagnosed with a lump on her right rib cage close to the arm pit anyway she got the aspiration done pathology said was inconclusive dr thinks its a fatty tumor between the tissues but he doesn’t like the location or the size so he wants to remove it and send it for testing. What do you suggest it is? And should i do surgery? Should i worry?